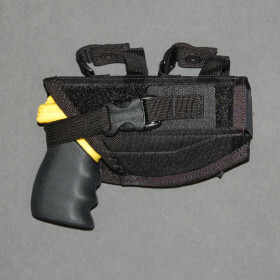 Enforcer CrossDraw Belt Holster » Protective Solutions, Inc.
Top quality holster made of nylon reinforced with Kydex. Cross draw, forward tilt, fits belt up to 2 1/4". Holds Enforcer plus 2 cartridges. Available in Black. Made specifically for the PhaZZer Enforcer CEW. Made in the USA.